07 May Was it turn-around week? The wool market opened the week with a continuation of the softer trend of last week, but on Thursday demand returned, and the market looked to have a completely different tone. This was best reflected by activity on the Fremantle auction floor; the close of last week in Fremantle was definitely “bearish”, while this week it acted like the “bull”, closing strongly. We take more notice of the Fremantle market when forming a view of next week’s market, with its 2-hour time difference a strong finish is positive for next week, while a weak finish doesn’t provide a lot of confidence going forward. With a similar offering to last week of 42,794 bales, the Eastern Market Indicator (EMI) lost 10 cents to 1836 cents, while in US$ terms the EMI gave up 17 cents over the week to settle at 1381 cents (Figure 1). In the Fremantle sales, the Western Market Indicator (WMI) slipped 10 cents on the opening day before fully recovering on Thursday to end the week up 3 cents to 1952 cents. The AU$ held steady around the US$0.75 mark, after slipping below the US$0.76 cent mark last week. In line with the slightly softer market in general, the pass in rate lifted to 5.3%. 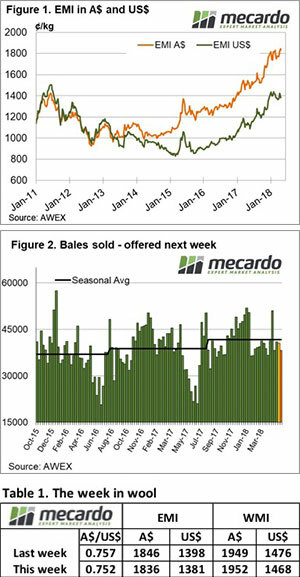 The varied pass-in rate makes interesting viewing; in Sydney it was 3.2%, Melbourne 5.3% while in Fremantle, despite the stronger market, growers were prepared to pass-in 8.2% resulting in 40,500 bales eventually sold. On the back of last week’s currency induced rally that provided wool sellers with new high’s, this week’s market can be taken as a positive with little resistance to the market levels despite the Wednesday easier market. AWEX reports that buyers are finding it difficult to “average” their purchases with the increasing percentage of lower yielding and poorer style wools offered. Of course, this is making more attractive any lots that are of good style and yield. Again, these types were reported as attracting strong competition. 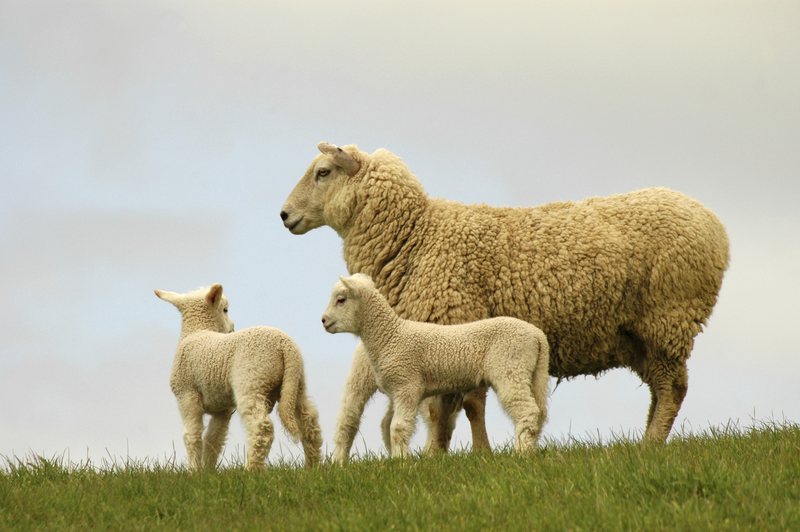 There was an interesting comment in the AWEX Sydney report on Wednesday; “19 microns and finer had good support for the Non-Mules and Pain relief lots”, perhaps reflecting specific demand for these wools. For some time, we have been interested in detecting any premium for non-mulesed or pain relief identified lots; this is a rare comment from AWEX that it was noticeable in the auction. Crossbreds retreated after five weeks of positive gains, while the cardings were generally unchanged except for W.A. where the correction was a re-alignment with Eastern markets. Skirtings were reported as steady for the week, although again the AWEX report contained a proviso that lots with less than 3% VM were keenly sought. With just over 40,000 bales sold this week, (seasons average 41,868) we expect it will be difficult to retrieve sales above this level until the Spring. There are 38,200 bales rostered for next week, however the roster falls to an average of 35,000 bales for the following weeks. With the average clearance since January of almost 42,000 bales, the seasonal average can’t help but fall in coming weeks. The market had a go at correcting the strong recent weeks, but by week’s end it was back to business as usual. This along with tightening supply (38,000 rostered for next week) bodes well for the immediate future of wool prices in general.